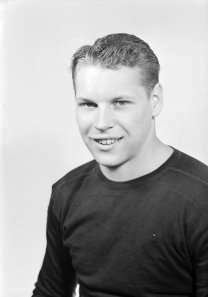 Robert John Zimny (December 11, 1921 – August 11, 2011) was an American football tackle who played two seasons with the Chicago Cardinals of the National Football League (NFL). He was drafted by the Brooklyn Tigers in the 28th round of the 1944 NFL Draft. He played college football at Indiana University and attended St. Rita of Cascia High School in Chicago, Illinois. He was a member of the Chicago Cardinals team that won the 1947 NFL Championship. ↑ "BOB ZIMNY". profootballarchives.com. Retrieved 22 August 2014.